Detox water is a recent phenomenon that caught on due to its repeated mentions in the social media. 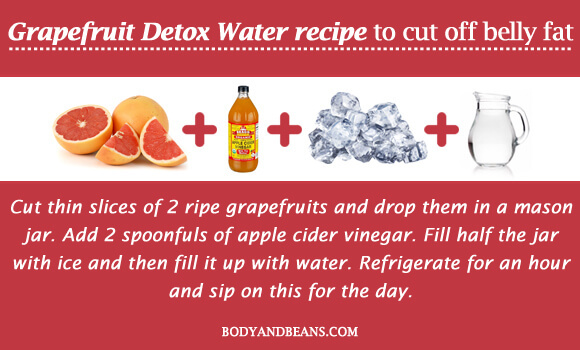 You can even find certain celebrities tweeting or posting on instagram about detox water recipes. Detox water is, basically, water infused with fruits or vegetables that is considered healthy for your body. It flushes out the toxins and cleanses your overall systems. Drinking detox water is probably one of the easiest ways to lose extra fat. It is believed that detox water temporarily increases the metabolic rate of the body, which in turn burns more calories. It is also beneficial to improve your digestive health and to boost your immune system. 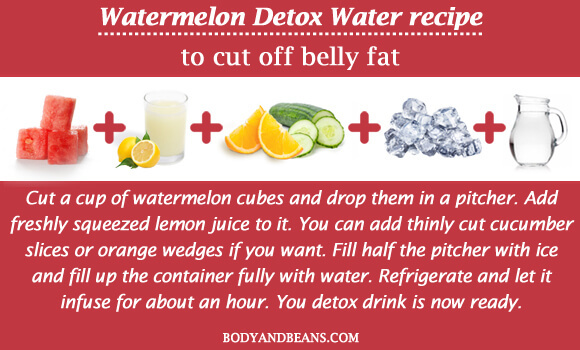 If you are working to get rid of belly fat, then try some of these detox water recipes for belly fat which will take you closer to your fitness goal. December and January is the month of resolution. Most of the gym subscription is sold in December and January. But just working out in the gym may not be good enough, because one has to consider the daily intake as well. And if you are determined to put off some weight and wondering what could help you then here’s the post worth checking. 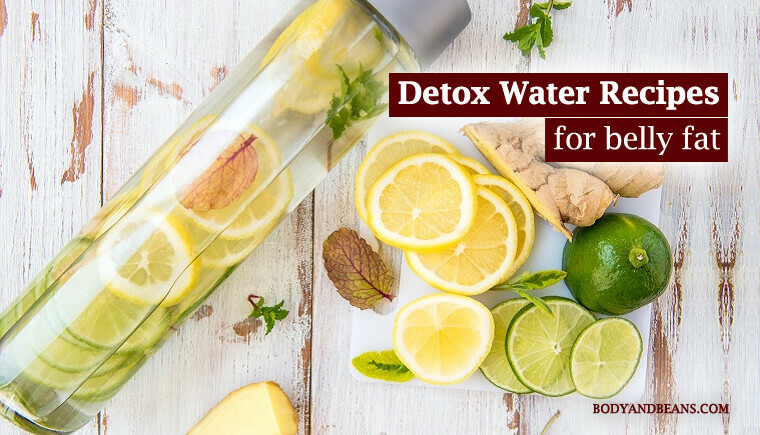 Today in this post, I am going to share some of the best detox water recipes for belly fat and when followed with proper workout and diet schedule, these recipes will certainly help you get closer to your fitness goal of this New Year. Detox water basically is water which is infused with several fresh and healthy ingredients, mostly vegetables and fruits like cucumber; strawberry, lemon etc. the simplest example could be the lemon and water, which one can drink everyday to cleanse the internal system, specially the stomach. 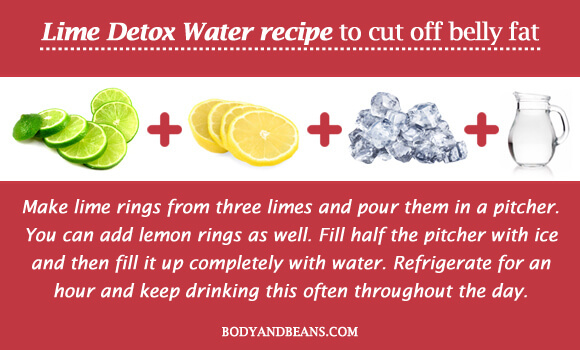 There are various detox water recipes that works differently. 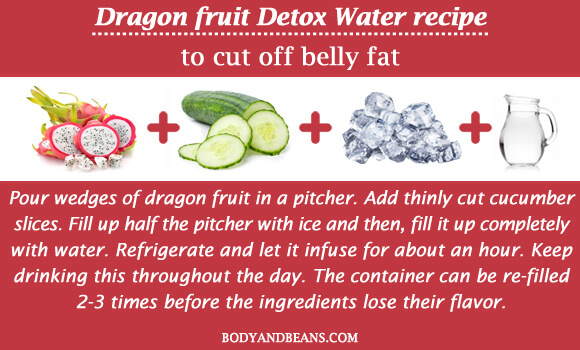 Today I am sharing the most effective detox water recipes for belly fat. 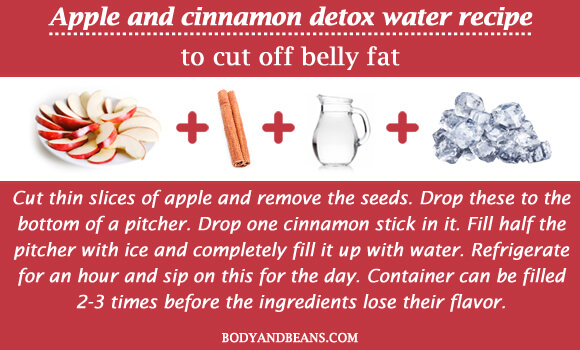 And here is the best and most delicious detox water recipes for belly fat that will help you get slimmer easily. According to modern studies in Food Chemistry, apples contain non-digestible compounds that promote growth of good bacteria in the gut, related to weight loss. Cinnamon slows down the digestion process and hence, keeps our appetite satiated for a longer time, reducing our craving for food. It is also believed that cinnamon helps in digest and metabolize carbohydrate more efficiently, which also leads to you losing a few extra pounds. Cut thin slices of apple and remove the seeds. Drop these to the bottom of a pitcher. Drop one cinnamon stick in it. Fill half the pitcher with ice and completely fill it up with water. Refrigerate for an hour and sip on this for the day. Container can be filled 2-3 times before the ingredients lose their flavor. 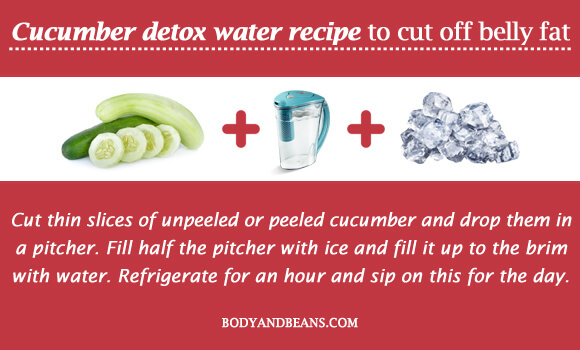 This is, perhaps, the most well-known and universally favorite kind of detox water. When it comes to health, cucumber has a lot of benefits. It is high in fiber and low in calories, which keeps our hunger satisfied for a longer stretch. Cucumbers also contain high concentration of potassium and magnesium, which help regulate our blood pressure. It contains a flavonol called fisetin that is anti-inflammatory and stimulates brain health. Cucumbers are anti-oxidant, which contain polyphenols called lignans that keeps cancer at bay. 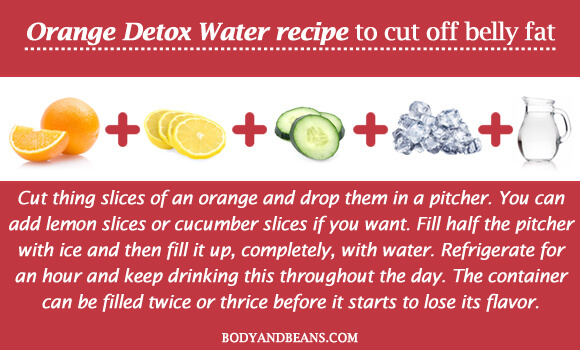 Here is how to prepare the detox water with cucumber. Cut thin slices of unpeeled or peeled cucumber and drop them in a pitcher. Fill half the pitcher with ice and fill it up to the brim with water. Refrigerate for an hour and sip on this for the day. Container can be filled 2-3 times before the ingredients lose their flavor. If you are looking to lose weight, quickly, before attending a party, then this detox is very suitable for you. If you drink 6-12 glasses of this detox water as tonic daily, you will around 4 to 5 pounds weekly. Just keep in mind that while on this diet, no solid food is allowed. 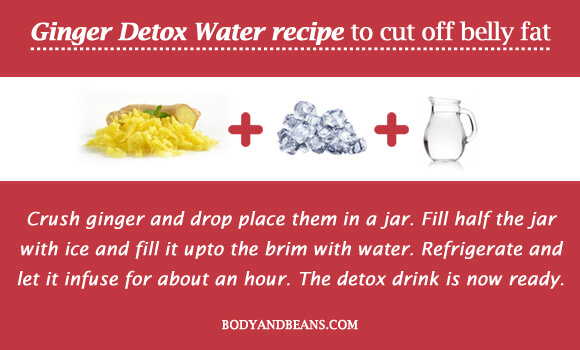 Here is how to prepare this detox recipe. 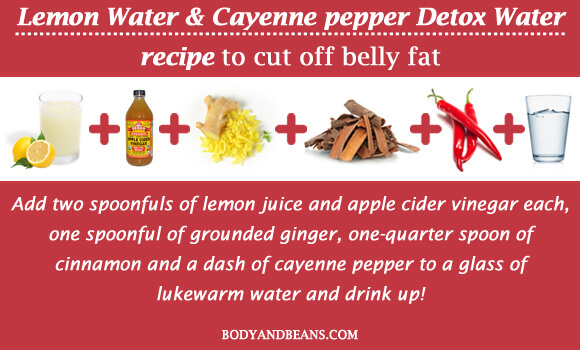 Add two spoonfuls of lemon juice and apple cider vinegar each, one spoonful of grounded ginger, one-quarter spoon of cinnamon and a dash of cayenne pepper to a glass of lukewarm water and drink up! Strawberries increase the production of hormone that enhances metabolic rate and keeps our food cravings at bay. Watermelon is a low energy dense food. Even if eaten in large quantity, it provides fewer calories. 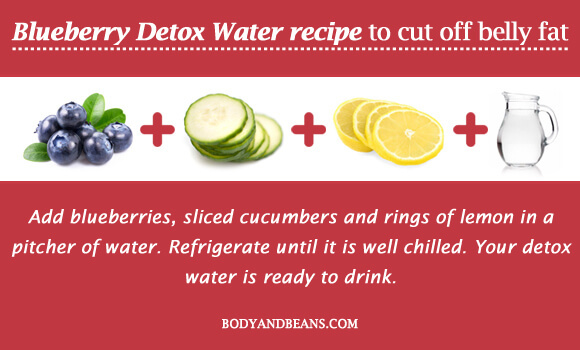 Given below is how to prepare the detox water. Blend diced watermelon, strawberries and freshly squeezed lemon juice. Pour this blend in a mason jar and fill half the jar with ice. Then fill up the jar with water. Refrigerate for an hour and keep sipping this throughout the day. Blueberry blocks cholesterol naturally. It lowers the secretion of HMG-CoA reductase, an enzyme produced by your liver to make cholesterol. Blueberries contain polyphenols that fights excess blood-glucose level. Therefore, it prevents our blood pressure from rising. Here is how to prepare the drink. Add blueberries, sliced cucumbers and rings of lemon in a pitcher of water. Refrigerate until it is well chilled. 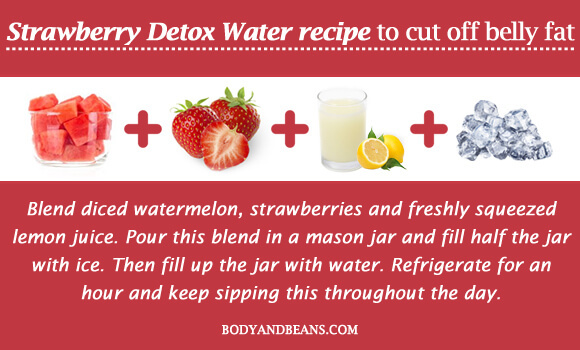 Your detox water is ready to drink. Lime is rich in Vitamin C. A Vitamin C rich diet helps you burn 30% more fat than you would normally burn. Make lime rings from three limes and pour them in a pitcher. You can add lemon rings as well. Fill half the pitcher with ice and then fill it up completely with water. Refrigerate for an hour and keep drinking this often throughout the day. Backberries contain tannis which reduces intestinal inflammation. Blackberries are high in potassium, which is mildly diuretic and helps support the health of the kidneys and liver, besides reducing belly fat. Nootkatone, an organic compound in grapefruit, activates the enzyme called AMP-activated protein kinase. Activated AMPK enhances the energy producing process in the body, which stimulates metabolism. This, in turn, leads to burning of excess fat and reduction on body weight. Here’s how to prepare a grapefruit detox drink. Cut thin slices of 2 ripe grapefruits and drop them in a mason jar. Add 2 spoonfuls of apple cider vinegar. Fill half the jar with ice and then fill it up with water. Refrigerate for an hour and sip on this for the day. Raspberry has been known to prevent fat build-up in the liver, which, in turn, averts liver inflammation. Given below is a recipe for raspberry detox drink. 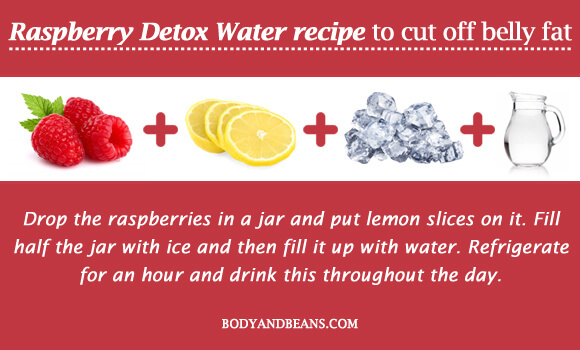 Drop the raspberries in a jar and put lemon slices on it. Fill half the jar with ice and then fill it up with water. Refrigerate for an hour and drink this throughout the day. Oranges are high in dietary fiber. They keep our appetite satiated for a longer time and reduce our food intake. Here’s how to make an orange detox drink. Cut thing slices of an orange and drop them in a pitcher. You can add lemon slices or cucumber slices if you want. Fill half the pitcher with ice and then fill it up, completely, with water. Refrigerate for an hour and keep drinking this throughout the day. The container can be filled twice or thrice before it starts to lose its flavor. Mint leaves contain trace amounts of catechins and caffeine. These two chemicals tend to boost our metabolic rate by increasing the body temperature, which, in turn, leads to burning extra calories than your body normally does. Mint is, also known, to suppress hunger and reduce food intake. It is also beneficial to improve overall health of our digestive system. 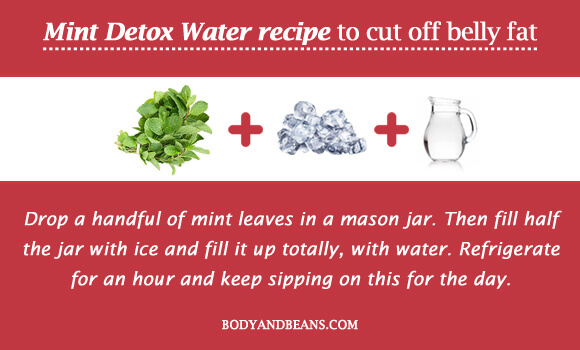 Here’s how you can make yourself a jar of mint detox drink. Drop a handful of mint leaves in a mason jar. Then fill half the jar with ice and fill it up totally, with water. Refrigerate for an hour and keep sipping on this for the day. Ginger inhibits cortisol. High levels of cortisol enhances excess fat disposition in the belly, leading to weight gain. Ginger increases metabolism and helps in proper digestion of food. Ginger helps reduce the cholesterol level in the body by significantly reducing serum and hepatic cholesterol levels. 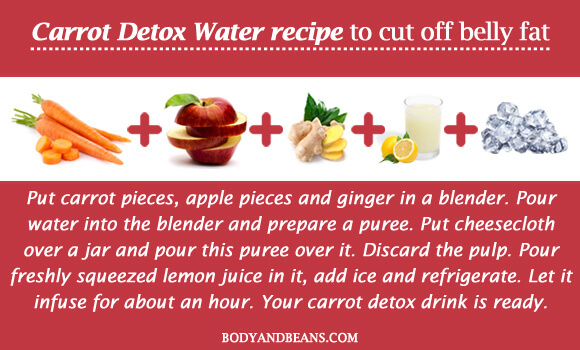 Given below is a recipe of ginger detox drink. Crush ginger and drop place them in a jar. Fill half the jar with ice and fill it upto the brim with water. Refrigerate and let it infuse for about an hour. The detox drink is now ready. Pineapple is a good source of manganese that metabolizes carbohydrates and fat. It contains an enzyme called bromelain that is anti-inflammatory in nature. 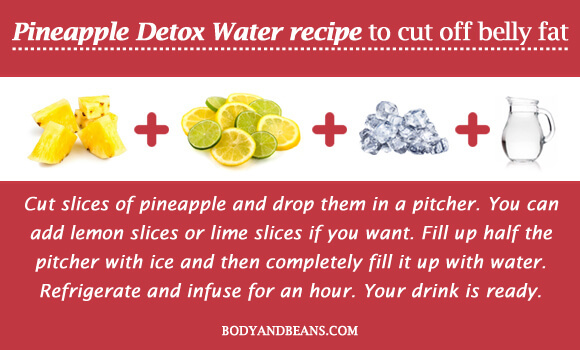 Here’s a recipe for pineapple detox drink. Cut slices of pineapple and drop them in a pitcher. You can add lemon slices or lime slices if you want. Fill up half the pitcher with ice and then completely fill it up with water. Refrigerate and infuse for an hour. Your drink is ready. This exotic fruit controls our food cravings and helps us lose weight. It is rich in fiber and low in calories. It also helps control our blood sugar level. Dragon fruit makes sure we eat less calories than we burn. Here’s how to make a dragon fruit detox drink. Pour wedges of dragon fruit in a pitcher. Add thinly cut cucumber slices. Fill up half the pitcher with ice and then, fill it up completely with water. Refrigerate and let it infuse for about an hour. Keep drinking this throughout the day. The container can be re-filled 2-3 times before the ingredients lose their flavor. Fat cells are acidic in water. Watermelon, being alkaline in nature, helps your body to break down the fat. It is a good source of potassium, that helps keep our kidneys in good shape. Watermelon contains glutathione, a powerful antioxidant that flushes out the harmful toxins from our system. Here’s a recipe to make a cool watermelon detox drink. Cut a cup of watermelon cubes and drop them in a pitcher. Add freshly squeezed lemon juice to it. You can add thinly cut cucumber slices or orange wedges if you want. Fill half the pitcher with ice and fill up the container fully with water. Refrigerate and let it infuse for about an hour. You detox drink is now ready. Holy basil lowers the level of cortisol in the body. Elevated level of cortisol or stress hormone, leads to weight gain, especially deposition of fat in the lower abdomen. Holy basil is a natural adaptogen, which means, it helps us cope with stress more efficiently. It is anti-carcinogenic and anti-oxidant that flushes out the toxins from our body. 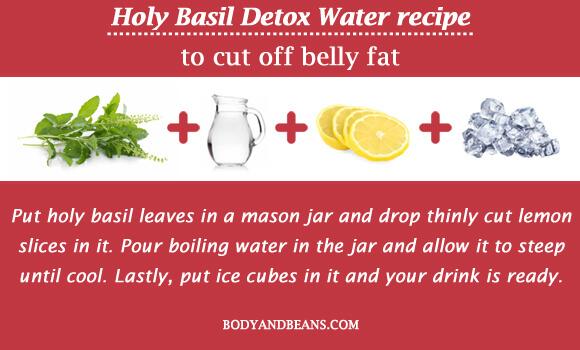 Here’s a recipe for holy basil detox water. Put holy basil leaves in a mason jar and drop thinly cut lemon slices in it. Pour boiling water in the jar and allow it to steep until cool. Lastly, put ice cubes in it and your drink is ready. Kiwi, being a rich source of fiber, is a natural appetite suppressant. It keeps our stomach full for a longer time and reduces our food cravings. It has fewer calories compared to grapes or sugarcane. 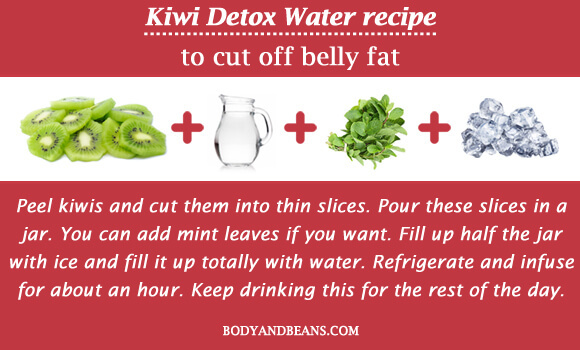 Here’s how you can make yourself a kiwi detox drink. Peel kiwis and cut them into thin slices. Pour these slices in a jar. You can add mint leaves if you want. Fill up half the jar with ice and fill it up totally with water. Refrigerate and infuse for about an hour. Keep drinking this for the rest of the day. The plant sterols in aloe vera help reduce weight, especially by burning abdominal fat. It is a known natural remedy to boost metabolism and eliminate excess calories. 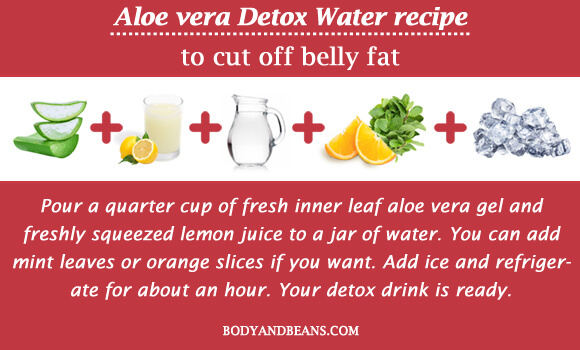 Here’s a recipe to make aloe vera detox water. Pour a quarter cup of fresh inner leaf aloe vera gel and freshly squeezed lemon juice to a jar of water. You can add mint leaves or orange slices if you want. Add ice and refrigerate for about an hour. Your detox drink is ready. Carrot is a low energy-density vegetable that is high in slow-digesting fiber. It also possesses low glycemic index that helps us lose those extra calories, rapidly. Additionally, they are fluid-dense that helps us feel full for a longer period. Here’s how to make a carrot detox drink. Put carrot pieces, apple pieces and ginger in a blender. Pour water into the blender and prepare a puree. Put cheesecloth over a jar and pour this puree over it. Discard the pulp. Pour freshly squeezed lemon juice in it, add ice and refrigerate. Let it infuse for about an hour. Your carrot detox drink is ready. As we all know, drinking cold water increases body metabolism. It makes our body work harder and burn more calories to warm up the water, hence help us burn excess fat. Water is a powerhouse of nutrients which keeps the systems of our body in optimum working condition. Some of the ingredients might have side-effects, like; holy basil is affiliated with causing infertility. Consulting with your physician about the correct dose of ingredients is suggested. 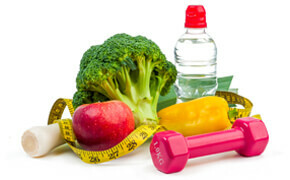 Have you resolved to put off some weight and get in shape this year? Well, then you got to start working on this goal and try some of these detox water recipes which will help you move closer to your goal. Till then stay fit and look good.